This rare print of a work by Irish artist John O’Connor (1830 – 1889) is a recent gift to the Stirling Smith collections. It was donated by Jean Archibald, who when working for the British Library, was able to pick up interesting Scottish views from the print shops in Great Russell Street, London. The image dates from 1869 or after, when the Wallace Monument was completed on Abbey Craig. As the work was engraved by H. Adlard for reproduction, it must have been completed in 1869, as works by him are limited to the period 1824 – 1869. O’Connor had a very interesting career. Orphaned at the age of 12, he got work as a call boy and assistant scene painter in a Belfast theatre. He became skilled in painting and got another post in Drury Lane Theatre in 1848, moving to the Haymarket Theatre as Principal Scene Painter in 1863. He exhibited his own work from 1854 onwards, and obtained the patronage of the Royal family. 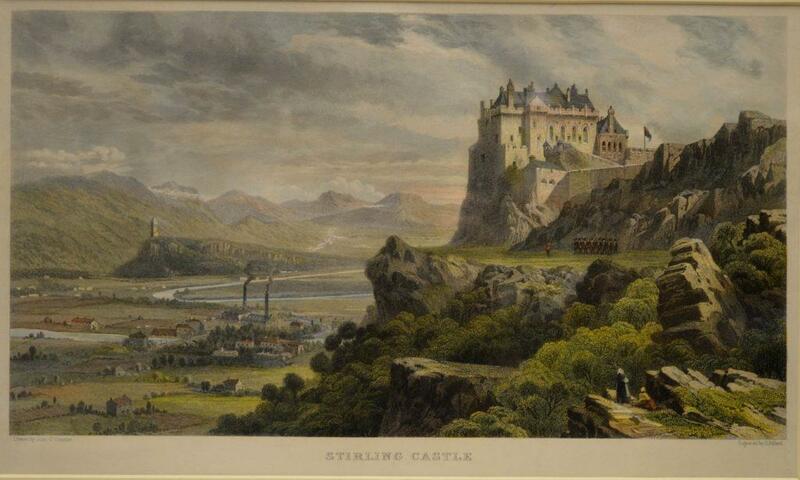 His view of Stirling incorporates all of the best features of the landscape, but as a scene painter, he has manipulated them to create a familiar, if unrealistic picture, showing features which cannot be seen from one viewpoint.